So how’d we miss this? Well, it finally turned up in the Previews magalog, so now it can be told. Back in the late 70’s and early 80’s, animated cartoons (both feature and on TV — remember this was pre-web) were in a sorry stage, and worthwhile projects were few and far between. After the doors were kicked open (and the bar raised — very much!) by movies like Who Framed Roger Rabbit? in the late 80’s, animation really exploded in the 1990’s… culminating, of course, in the highest-grossing 2D animated film of all time — The Lion King — and the beginnings of the empire we now know as Pixar. 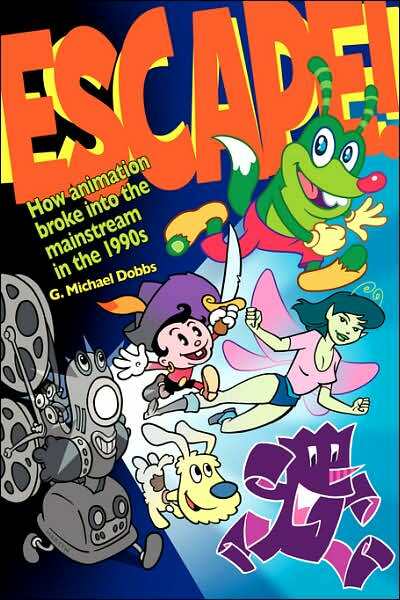 Back in 2007, author G. Michael Dobbs (a former editor for the magazines Animato and Animation Planet) published a book that details this late-century explosion of animation called Escape! How Animation Broke into the Mainstream in the 1990’s. 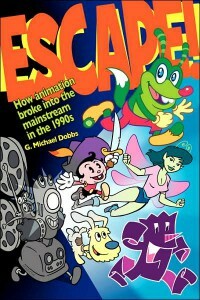 Through extensive reviews and interviews with with animation professionals, the book not only examines how animation became the box-office powerhouse we now know it as, but also how the cartoons of the 1990’s and after forever put to rest the notion (long-held in western civilization) that cartoons are not a medium that grown-ups should think about much. The book is still available in paperback at Amazon, from Bear Manor Media.